J, I love you. You know I do. But I do not like those rabbits. I do not like them at all. Sorry Michelle. It’s a good thing I didn’t include audio… bwa haa haaaa! 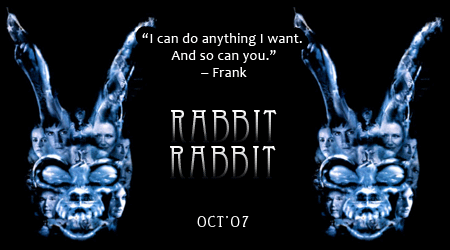 Hooray for Donnie Darko! Have you seen that Southland Tales is finally come out too??? I’m nervous about Southland Tales. It’s an ambitious undertaking and the early reviews haven’t been too kind. I plan on seeing it; we’ll see what happens.